Before Windows 10, a clean install of Windows only included the bare essentials a user would need to get started using their PC. 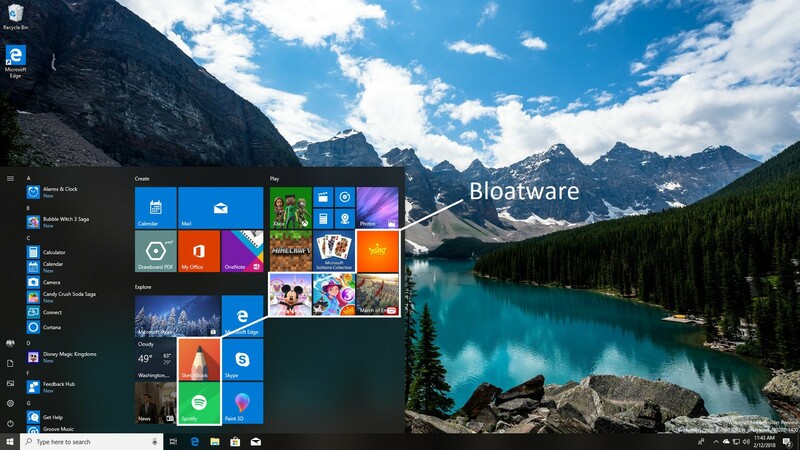 That included software built by Microsoft, such as Mail, Paint, and its web browser, and it never included “bloatware” or “trialware” that one might find on hardware purchased from a third-party OEM that preloaded all kinds of crapware. The clean install process was simple. With Windows 7, you’d do the install, and once you hit the desktop, that was it. All the programs that were preinstalled were Microsoft-made and were often considered essentials. This changed with Windows 8, with the addition of auto-updating apps such as Travel, News and more. Still, these were acceptable, preinstalled Windows apps and were not really classed as bloatware. There are policies you can set that disable these apps from automatically installing, but that’s not the point. On a fresh, untouched, clean install of Windows 10, these apps will download themselves onto your PC. Even if you cancel the installation of these apps before they manage to complete the download, they will retry at a later date, without you even noticing. The only way I’ve found that gets rid of them permanently is to let them install initially, without canceling the download, and then uninstall the apps from the Start menu. If you cancel the initial download of the bloatware apps before they complete their first install, the Microsoft Store will just attempt to redownload them later and will keep doing so until that initial install is complete.